Interstate 75 (I-75) is a major north–south Interstate Highway in the Great Lakes and Southeastern regions of the United States. As with most Interstates that end in a five, it is a major cross-country, north–south route, one of the longest in the U.S., from southern Florida to the northern tip of Michigan. It travels from State Road 826 (SR 826, Palmetto Expressway) and SR 924 (Gratigny Parkway) on the Hialeah–Miami Lakes border (northwest of Miami, Florida) to Sault Ste. Marie, Michigan, at the Canadian border. I-75 passes through six different states over its routing. The highway runs the length of the Florida peninsula from the Miami area and up the Gulf Coast through Tampa. Further north in Georgia, I-75 connects to Macon and Atlanta before running through Chattanooga and Knoxville and the Cumberland Mountains in Tennessee. I-75 crosses Kentucky, passing through Lexington before crossing the Ohio River into Cincinnati, Ohio. In the Buckeye State, the highway runs up the western side through Dayton before crossing into Michigan north of Toledo. I-75 runs northeasterly along the Lake Erie shoreline and Detroit River into the city of Detroit before turning northwesterly and northward to the Mackinac Bridge where the freeway crosses the strait between Lakes Huron and Michigan. Further north, I-75 approaches the Canadian border down river from Lake Superior, 1,786 miles (2,874 km) from its origins near the Atlantic Ocean. I-75 starts at an interchange with SR 924 and SR 826 on the Hialeah–Miami Lakes border in suburban Miami. After an intersection with the Homestead Extension of Florida's Turnpike and an interchange with I-595 and the Sawgrass Expressway, the Interstate leaves the Miami metropolitan area and turns westward to travel through the Everglades along the tolled Alligator Alley, which brings the highway to the Gulf Coast and Naples, where it again heads north. Passing through Bonita Springs, Fort Myers, and Sarasota, I-75 encounters a series of construction projects that will increase the lane count from two lanes in each direction to three in each direction. The freeway enters the Tampa Bay metropolitan area before the interchange with I-275 northbound, which handles St. Petersburg-bound traffic. Within the Tampa metro are three more major junctions: One with the Lee Roy Selmon Expressway which carries traffic into downtown Tampa; one with I-4 which carries traffic across the center of the state to the East Coast; and another as I-275 traffic defaults back onto northbound. The freeway proceeds to enter suburban portions of Pasco, Hernando, and Sumter counties on its way to Ocala and Gainesville. At Lake City, Florida, the Christopher Columbus Transcontinental Highway, I-10, intersects with I-75. Afterward, the northmost stretch of I-75 in Florida exits the Sunshine State into southern Georgia. I-75 (unsigned State Route 401 within Georgia) enters Georgia near Lake Park, and it continues northward through the towns of Valdosta, Tifton and Cordele until it reaches the Macon area, where it intersects with I-16 eastbound towards I-75's route. After Macon it passes the small town of Forsyth. The freeway reaches no major junctions again until in the Atlanta metropolitan area. The first metropolitan freeway met is I-675, then followed by the Atlanta "Perimeter" bypass, I-285. It crosses inside the Perimeter and heads north several miles towards the Atlanta city center. Interstate 75 then runs concurrently with I-85 due north over the Downtown Connector through the central business district of Atlanta. The areas where I-85 and I-75 run concurrently are some of the most traffic-prone streets in the nation. After the two Interstates split, I-75 makes a beeline northwest, crossing outside the I-285 perimeter and heading towards the major suburban city of Marietta. This section of I-75 just north of I-285 has 15 through lanes. North of Marietta, the final major junction in the Atlanta metropolitan area is the I-575 spur. I-75 then traverses the hilly northwestern Georgia terrain as it travels towards Chattanooga, Tennessee. All of Interstate 75 in Georgia is at least 3 lanes in each direction. The freeway enters Tennessee directly in the Chattanooga metropolitan area, where it intersects with I-24. Exiting Chattanooga to the northeast, I-75 passes through an area known for dense fog. Twelve people were killed and 42 were injured in a 99-vehicle accident on that stretch of I-75 in heavy fog on December 11, 1990. I-75 does not meet any other freeways until it overlaps I-40 near Farragut and heads eastbound. Together, they enter the outskirts of Knoxville, where I-75 overlaps itself with a different road, this time I-640, but only for a short time. When the two meet I-275, I-75 encounters some of its highest points of elevation through the Cumberland Mountains and Cumberland Plateau region, cutting through the uppermost peaks and ridges of the mountains. I-75 continues northbound through the hilly, rugged terrain of the Cumberland Plateau region of Kentucky passing through London and Richmond, eventually reaching Lexington, where it briefly runs concurrently with I-64 before splitting off in the direction of Georgetown. Afterwards, the route heads in the direction of Ohio. Near Walton, I-71 merges with I-75, making for yet another overlapped portion of freeway. The two routes head in the direction of Cincinnati, Ohio. I-275, which is the beltway around Cincinnati, is then intersected by I-71/I-75. After passing through Covington, the freeway crosses the Ohio River via the lower level of the Brent Spence Bridge (while the southbound direction uses the upper level) and continues into downtown Cincinnati. Immediately after entering Cincinnati, I-71 separates from I-75, taking a more east and northeasterly routing through the city, while I-75 remains generally northbound throughout the metropolitan area. I-74 westbound, Ohio State Route 562 (SR 562) eastbound, and SR 126 all intersect the freeway as it makes its way northward. In Arlington Heights, a Cincinnati suburb, I-75 sees a carriageway split for a few miles. After another interchange with the I-275 beltway, the freeway continues in the metropolitan area, passes through Middletown and heads toward Dayton, where I-675, I-70, and U.S. Route 35 (US 35), have interchanges. The intersection of I-75 with I-70 is known as the Freedom Veterans Crossroads. After exiting the city of Dayton, I-75 makes its way northbound through Ohio, passing through the smaller cities of Troy, Wapakoneta, Lima, Findlay and Bowling Green before finally reaching Toledo, and its suburbs located on the Michigan border on the western shore of Lake Erie. I-75 meets I-475 south of the city in the suburb of Perrysburg and then the cross-country highways of I-80/I-90/Ohio Turnpike. The freeway passes through downtown. I-475 then meets with I-75 again just north of downtown. 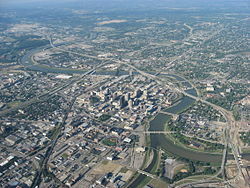 The Interstate then continues through an industrial part of the city, as it progresses north before approaching I-280, which is the last major junction in Ohio. I-75 then passes by the Lake Erie neighborhoods of Shoreland and Point Place, just before crossing into Michigan. Sault Ste. Marie International Bridge, linking Upper Michigan to Ontario. Upon entering Michigan, I-75 follows the northwestern shore of Lake Erie passing through Toledo's bedroom lake shore communities of Erie and Luna Pier, until about Monroe, when it heads northeastward to enter Detroit and its surrounding suburbs. The freeway intersects another I-275 in the Detroit metropolitan area, and no other major junctions are present until downtown. Once near downtown, I-75 meets the Ambassador Bridge to Windsor, Ontario, I-375 (Chrysler Freeway), I-94 (Edsel Ford Freeway), I-96 (Jeffries Freeway), M-10 (Lodge Freeway) and M-8 (Davison Freeway). I-696 (Reuther Freeway) also intersects I-75 in the northern metro area. When the freeway reaches Pontiac, there is a junction with M-59, and further north in Flint, the Interstate meets I-475 and I-69, and overlaps US 23. The freeway then heads north towards Saginaw, where I-675 acts as a spur route into the city. Further north in Bay City, US 10 provides access to Midland as well as downtown Bay City. When the freeway nears Standish, US 23 branches off I-75 to Lake Huron, where it heads north. The last major interchange occurs at 4 Mile Road just south of Grayling where US 127 northbound ends with traffic merging onto northbound I-75 and the southbound starts taking drivers southward through the center of the state. At Mackinaw City, I-75 intersects the northern ends of US 31 and US 23 before crossing the Mackinac Bridge to reach the Upper Peninsula (UP). I-75 is the only Interstate located in the UP, and it continues until the Canadian border in Sault Ste. Marie, at the International Bridge. This limited access highway that was planned in the 1950s roughly follows the general route of many older at-grade highways, including US 2, US 27, US 25, and US 41, among others. Some of these older US Highways (several of which are still in existence) previously had replaced the eastern route of the old Dixie Highway. I-75 was planned to end in Tampa, Florida, in the original plan for 41,000 miles (66,000 km) of Interstate Highways. However, beginning in the 1960s, there was a huge growth in the population of Southwest Florida (Sarasota, Fort Myers, Naples, Cape Coral, etc. ), hence the need for new highways, especially a north–south freeway, as well as one connecting Florida's Gulf Coast to South Florida. At first, Florida state legislators proposed a toll in the new highway, but by 1968, it was decided that the federal government would pay 90% towards the extension of I-75 to southwestern and southeastern Florida. This included subsuming a toll highway from Naples to the Fort Lauderdale area, the Alligator Alley, and furthermore to connect this expressway with I-95 in North Miami—though due to some local opposition, I-75 presently ends a few miles short of I-95. On December 21, 1977, I-75 was completed from Tampa to Sault Ste. Marie with its final segment opening between northern Marietta, Georgia, and Cartersville, Georgia. The final stretch of I-75 in South Florida was completed in 1986 in Miami-Dade County and Broward County, but the last stretch to receive the signs for I-75 was the reconstructed (rebuilt and widened) Alligator Alley on November 25, 1992. US 41 northwest of Valdosta. The highways travel concurrently to Hahira. I‑85 in Atlanta. The highways travel concurrently through Atlanta. US 11 / US 64 in Chattanooga. The highways travel concurrently to north of Collegedale. I‑40 west of Farragut. The highways travel concurrently to Knoxville. I‑40 / I‑640 in Knoxville. I-75/I-640 travels concurrently through Knoxville. US 25W in Knoxville. The highways travel concurrently through Knoxville. US 25W in Rocky Top. The highways travel concurrently to Caryville. US 25 / US 421 south-southeast of Lexington. The highways travel concurrently to Lexington. I‑64 in Lexington. The highways travel concurrently through Lexington. I‑71 in Walton. The highways travel concurrently to Cincinnati, Ohio. US 27 / US 52 / US 127 in Cincinnati. I-75/US 27/US 52 travel concurrently through Cincinnati. I‑475 / US 23 in Perrysburg. I-75/US 23 travels concurrently through Perrysburg. US 23 south-southwest of Flint. The highways travel concurrently to southwest of Standish. ^ a b DeSimone, Tony (October 31, 2002). "Table 1: Main Routes of the Dwight D. Eisenhower National System Of Interstate and Defense Highways as of October 31, 2002". Route Log and Finder List. Federal Highway Administration. Retrieved October 2, 2007. ^ Staff (October 28, 1992). "Safety Recommendation in reply to H-92-92" (PDF). National Transportation Safety Board. Retrieved December 28, 2008. ^ Keeter, Brian (October 25, 2004). "Nation's Top Highway Official Dedicates Key Dayton, Ohio, Interstate Interchange to State's Military Personnel" (Press release). Federal Highway Administration. Retrieved March 26, 2011. ^ "West Coast Turnpike Study Ordered By Kirk". St. Petersburg Times. April 20, 1967. p. 1B. ^ "I-75 Extension Should Kill Toll Road - Cramer". Daytona Beach Morning Journal. August 16, 1968. p. 16. ^ Staff. "Previous Interstate Facts of the Day". Celebrating the Eisenhower Interstate Highway System. Federal Highway Administration. Retrieved May 11, 2010. Rand McNally (2005). The Road Atlas (Map) (2005 ed.). Chicago: Rand McNally. ISBN 9780886408473. Transportation Statistics Office. "GIS Data / Map Directory". Florida Department of Transportation. Archived from the original on February 6, 2007. Pavement Management Office (February 2, 2007). "Pavement Management Reports". Florida Department of Transportation. Archived from the original on February 3, 2007. Office of Transportation Data (2003). Interstate Mileage Report (438 Report) (PDF) (Report). Georgia Department of Transportation. Archived from the original (PDF) on 2006-02-18. Wikimedia Commons has media related to Interstate 75.